After taking the darshan of Maa Ganga at the Gangotri Temple, we visited the spectacular Surya Kund Waterfall. One has to cross an iron bridge to have a clear view of the magnificent falls. On one side of the bridge lies the Surya Kund and on the other side lies the Gauri Kund. The thundering milky white water bellowing down and the resulting froth that ensued made for an extremely pretty sight… What made it even more beautiful was the tiny little rainbow that had formed on the water by the sun’s rays!! Enlarge the pic to get a clear view of it! The beautiful smooth curves of the rocks implied that in the summers and the rainy season the water must be falling from the top of the cliff... what an astounding sight it would be then!! There is also a Shivling which is submerged in the river here. This natural rock Shivling is the place where Lord Shiva sat when he received the River Ganga in his matted locks. It is visible only in the winter months when the water level decreases. There is also the Pandav Gufa (cave) which is a 1.5 km trek from Gangotri. This is the place where the Pandavas are believed to have meditated on their way to the Kailash. The entire trek and the place around the cave is said to be very beautiful, full of natural splendor. 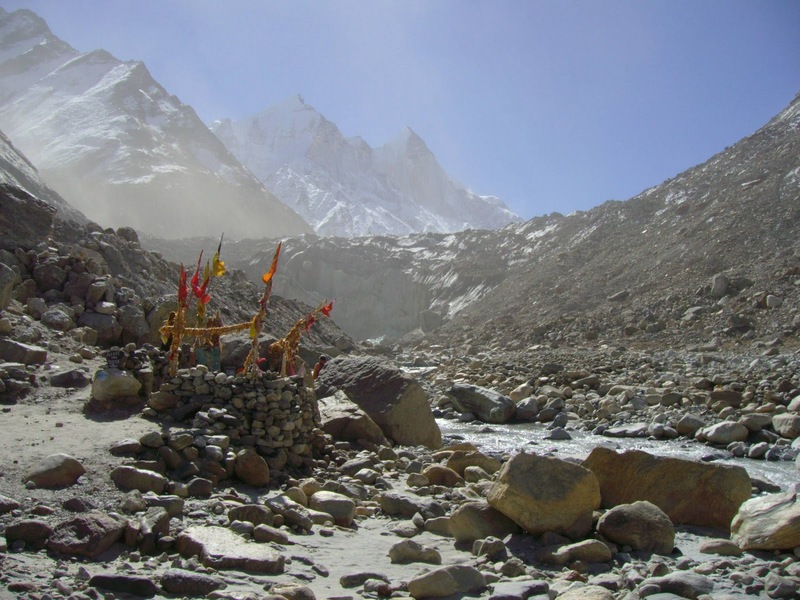 The Gaumukh glacier is the source of the Bhagirathi (Ganga) river and it is held in high esteem by the devotees who do not miss the opportunity to have a holy dip in the bone chilling icy water. The 18 km distance from Gangotri has to be covered on foot. There is a Tourist Bungalow at Bhojbasa, 14 km from Gangotri where lodging and other facilities are available. 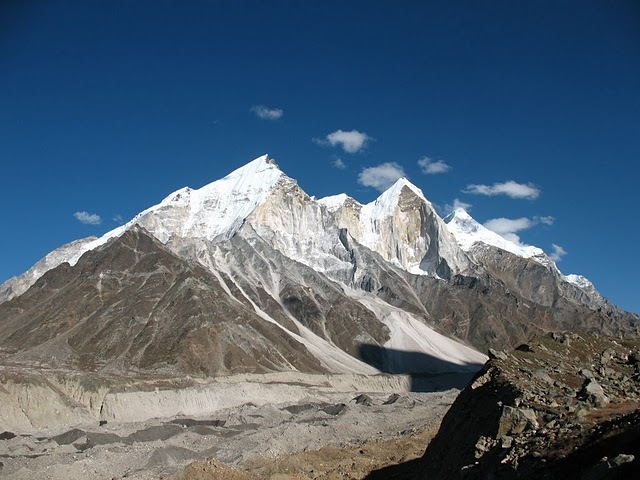 Extremely magnificent panoramic views of the Bhagirathi peaks are visible during this trek. A trek across the Gangotri glacier leads you to these two places. An ardous trek of 6 km from Gaumukh is worth the view it offers – the surrounding Shivling peak and beautiful meadows that surround its base. An enchanting lake at a distance of 18 km from Gangotri situated at an elevation of 4425 feet above the sea level against the majestic Thalaiyasagar peak in the background. The trekking route is rough and requires a local guide. 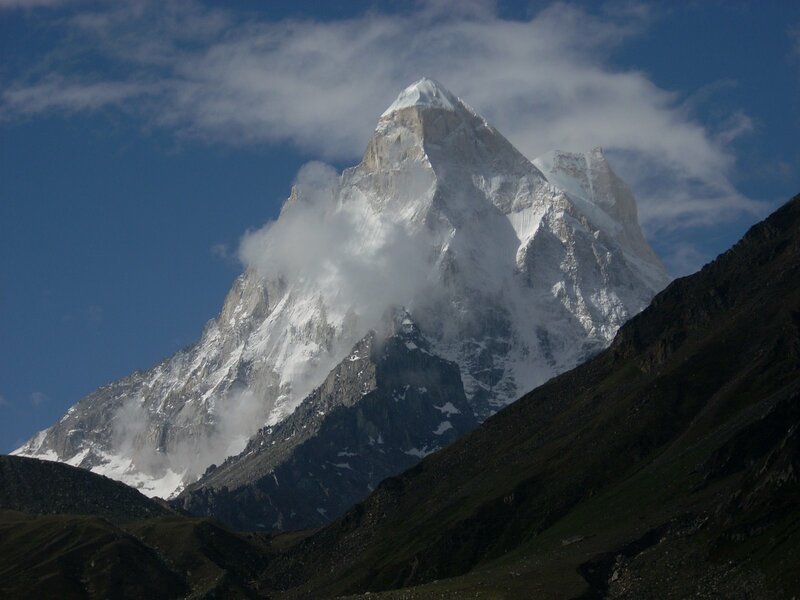 To view the travel route map for Gangotri - CLICK HERE. amazing pics arti:) keep it up!! What an amazing landscape Arti! I so hope to visit Indis one day, but it must be a trip with enough time to see a lot. Meanwhile, i enjoy travelling with you! Amazing & beautiful place!! So peaceful!! 'The thundering milky white water' - you have such a wonderful way with words it really is such a pleasure to travel with you like this. Wonderful Arti! Will definitely get back to your blog posts when I plan to visit Himalayas..! Gorgeous images and that waterfall is stunning. Incredible, breathtaking place!! And your captures are superb, Arti, as always! Thanks for sharing the beauty and the information! Fantastic! Hope you have a great week! Enjoy! Wow wow wow! What gorgeous shots - such spectacular mountains! The scenery here just takes my breath away Arti. Obviously a place you will want to go back to in the future -- so much to see there. Wonderful post. I LOVE those two close up pictures of the falls!!! Just spectacular!! And I did enlarge the picture to see the rainbow on the water, but I could also see it without enlarging. Those cliffs are so unusual looking, almost look man made, and the colors of them is pretty, as well. Actually, they match your new background, did you do that on purpose? Mesmerized by the pic and description. These are breathtaking photos. I thought its manmade coz it's so perfect esp the Surya Kund waterfall. That waterfall is just so amazing. I love your photos. Thank you for visiting my blog today. Just awesome , interesting information . Arti, you have assembled a wonderful travelogue of photos here and make a compelling argument for visiting this land. The rock formations are beautiful with the waterfalls. A visit to the glacier would be fabulous albeit a long hike. Thanks for your kind comments on my blog. India is a wonderful country which I would love to visit one day. The waterfall photos are amazing as are the mountain and lake shots! Terrific, as usual, Arti! What a beautiful travelogue. I love the rocks and the waterfalls. Thanks Tracy, coming from you... A master of words, this is a special compliment. It is not man made but natural made by the falling waters of the Ganges for so long!! And yes it is perfect, actually the level of water that you see here is much less, after all the snow melts the water falls from the top of the cliffs!! And also the color matches my background, nice observation Ginny... I did not do it on purpose!!! Beautiful place. This is surely on my wish list. Surya Kund, especially looks awesome...strangely smooth rocks! Those are indeed great captures. The post makes a great reading trip! Your pictures are always awesome Arti.. but these are the awesommest I have seen. Wow! Thoroughly enjoyed the blog. You are doing great work. Hi Arti, beautiful blog again! In Pics, Nature comes alive.